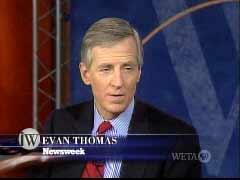 Newsweek editor Evan Thomas has created a precious contrast in the media's approach to presidents Bush and Obama. "Well, our job is to bash the president, that's what we do." -- Evan Thomas responding to a question on whether the media's unfair to Bush on the TV talk show Inside Washington, February 2, 2007. "I mean in a way Obama’s standing above the country, above – above the world, he’s sort of God." – Evan Thomas on Hardball, June 5, 2009.